Windows has very comprehensive network capabilities – a necessity in corporate environment, where it thrives. On other hand managing network settings is far from convenient. That hits notebook users especially hard and some manufacturers try to provide OEM software for network management with their machines. 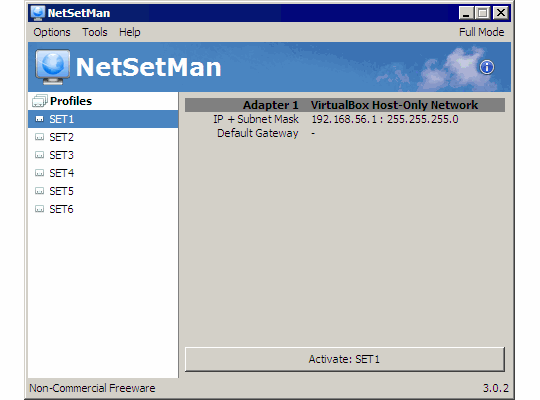 Another alternative is using dedicated network settings manager app like NetSetMan. There are two interface modes. The one that shows at start is used for configuration. Compact mode is streamlined to only show profiles and switch between them. Profiles can also be switched from tray menu or with command line parameters. run arbitrary user scripts (any OS-supported language, which makes batch best candidate or VBS for more complex scenarios). There is native portable installation option and flexible administration options to run it under limited user accounts. There is a menu option to quickly import existing network settings, but it fails with cryptic RPC error on both my desktop and notebook. Worked fine when I tried it at work, so I can only conclude it conflicts with some application or configuration option I use. Was unable to narrow it down so far. Free version has no limitations, but is licensed for non-commercial use only. There is also paid commercial version that adds few more functions like domain settings and proxy management. Very solid and highly functional application, slightly held back by non-commercial license. This tool is highly recommended for people, who frequently need to change their ip (for example when they need to connect locally to some machine, like wlan AP or other device with local address). I have been using this tool quite alot and I just love it. A real time saver, no doubt, I’m going to register this one to support it’s development. Thanks for sharing your experience, it’s always good to see my choices confirmed by readers. Pretty nifty for folks who use networking. Is everyone out there hooked to a network? I’m talking about home users. Are they? Really? It’s hard to believe how many people are willing to set up systems that share with their kids. Scary. Guess I’m one of the few in the universe who uses a standalone setup and doesn’t want it any other way. What I’d like is an application that will turn off all the extra processes/services that are network related and keep them that way. Following instructions in PC magazine, I managed to turn off as many as I dared. The results were instantaneous and dramatic. Speed to spare. Even with my little 512MB of RAM (I’ve since increased that). Better yet, I’d like a Windows OS – not ready to switch to Linux or Mac because of software issues – to ask me as I’m installing it “Will you be using a network?” Then I could say, “No. But thanks for asking,” and it would then skip adding all that bulk and bother. Don’t see that happening any time soon, so how about it? Will NetSetMan, or something like it, get rid of all the extraneous stuff? I generally advise against messing with system services. They don’t really make much of difference objectively (service running doesn’t really mean it necessarily does anything) and there is myriad of ways it can backfire. If you want network stuff down best and safest way is to disable network adapter in BIOS or Windows device manager. The most NetSetMan can do in this regard is disable network adapters. Very good application, I use it a lot, especially in my laptop. TCP/IP Manager, A open source software. The homepage is dead but is still available in softpedia. Give it a try if you want, see ya. Thanks! Bookmarked to check out.